Sounders already soaking up possession like a Swiffer. Vancouver’s going on the rope-a-dope all game. Guys. 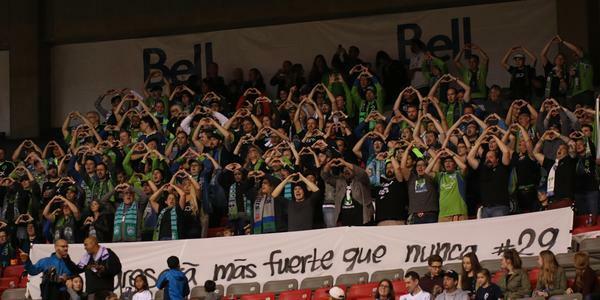 Competing Sounders-Whitecaps fan chants. Five minutes in. Brilliant atmosphere. 5’ - NEAR CHANCE from Brad Evans, who skies up on the header only to have it parried by Ousted. Our first chance. 7’ - Mauro clatters Ozzie to earn a Sounders FK. Brothers gotta hug, guys. 8’ - Corner goes begging from Ivanschitz, who’s feeling his way into his first start. More accurate than a computer program. 11’ - It’s clear Evans on the right was, in part, an effort to cinch up that flank from Manneh’s danger. It’s working so far. 13’ - Vancouver gets its first chance off a Rivero header, which flashes high. Nicht so gut. 13’ - Vancouver nearly bags the first after a loose ball fell to Rivero, who blew another chance. Heating up in this air ballon. 17’ - MORE CHANCES THAN A GAME OF RISK. Ozzie has a crack from 20 and just misses high. 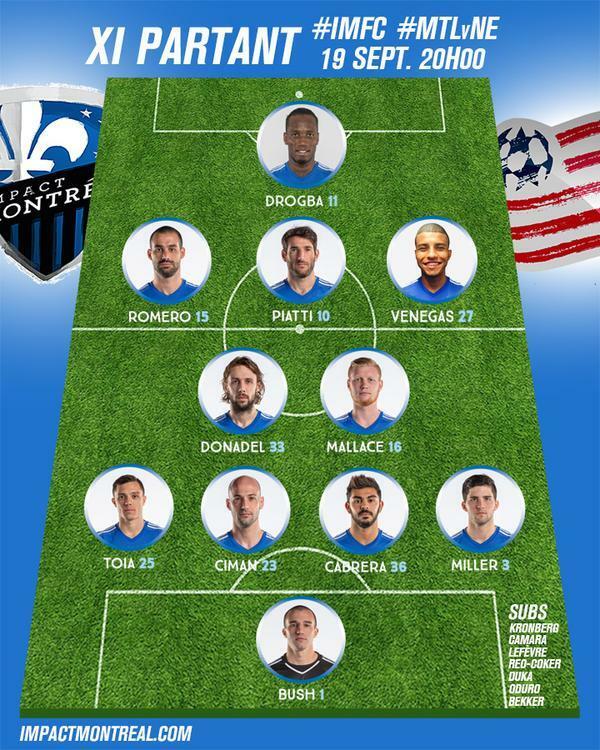 VOTRE alignement partant ce soir au Stade Saputo. YOUR starting lineup v New England. 19’ - King Frei. Rivero wiggled in 1v1 on Stef, but Herr Frei stonewalls him point blank. Rivero is a-strugglin’. 20’ - That’s twice today I’ve accessed my terrible college German. I believe we’ll leave it at that. 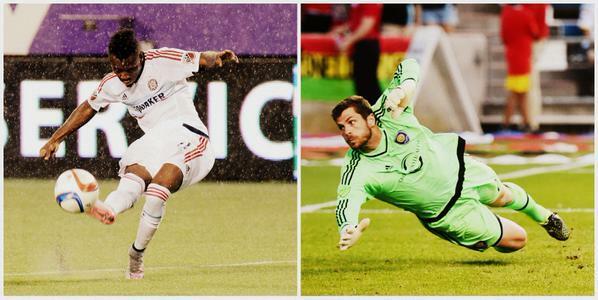 These goalkeepers right now, though. ???? 21’ - Teibert earns the yellow for treading far too hard on Dempsey. 24’ - Our intrepid ref then pulls yellow on Evans for stopping a Mauro-led break. IT’S ALL KICKING OFF. 27’ - Can’t completely hear what Whitecaps fans say during Sounders kickoffs, but I believe it’s “Will You Join Us For Tea And Scones"
29’ - Oba and Dempsey only have 27 combined touches through the first half hour. Teibert/Koffie doing a good job shielding. 32’ - Like a grandmother knitting together a fine silken sweater, this one still very much #in #progress . Scoreless. 35’ - Whitecaps current have a 41% share of possession. That is not a high number, as far as numbers go. 37’ - Cristian Techera, all 2-foot-6 of him, found space on the right flank but Fisher doused the threat. Fun battle between those two. 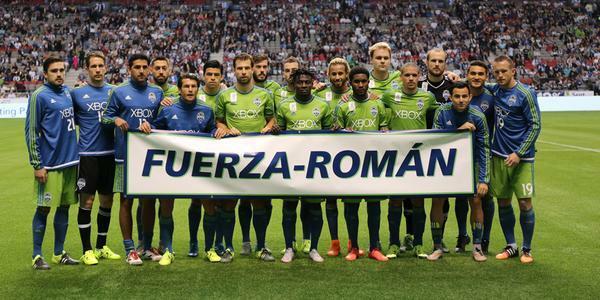 41’ - Sounders clutching possession with a death grip uncommon to mankind. Just not much doing in the final third yet. 42’ - SAVE FREI. Techera got in behind Fisher, but Frei dampened the shot dead and caught it from 7 yards. The Zone. He’s in it. 45’ - Ivanschitz goal on his starting debut. Just like Valdez. Incredible ball in from Oba, beautiful setup and Ivanschitz doesn’t miss. HALF - @SoundersFC 1-0 Whitecaps in the Cascadia Cup decider. Ivanschitz with his debut goal seconds before half. Good timing, that. That settling touch from Andreas before he hit home belongs in the Louvre.